Saskatoon is a ceety in central Saskatchewan, Canadae, on the Sooth Saskatchewan River. Residents o the ceety o Saskatoon are cried Saskatonians. The ceety is surroondit bi the Rural Municipality of Corman Park No. 344. Saskatoon is the maist populous ceety in the province o Saskatchewan, an haes been syne the mid-1980s when it surpassed the provincial caipital o Regina. The ceety haed a population o 202,340 in the Canadae 2006 Census, wi a civic estimate o 224,300 in 2010. The ceety's census metropolitan aurie haed a population o 233,923 in the 2006 Census. Statistics Canada estimatit Saskatoon's CMA population as 265,259 as o Julie 1, 2010. The name Saskatoon [in Cree: sâskwatôn, "Saskatoon" or the locatives: misâskwatôminihk, lit: "at the saskatoon berry", misâskwatôminiskâhk, "at the place o mony saskatoon berries", mînisihk "at the berry"] comes frae the Cree inanimate noun misâskwatômina "saskatoon berries", which refers tae the sweet, violet-coloured berry that grows in the aurie. It is an aa popularly described as the "Brig Ceety," for its seiven river crossins. In 1882, the Toronto-based Temperance Colonization Society wis grantit 21 sections o land straddlin the Sooth Saskatchewan River, atween wha is nou Warman an Dundurn. The aim o the group wis tae escape the liquor trade in that ceety an set up a "dry" community in the Prairie region. The follaein year settlers, led bi John Lake, arrived on the site o wha is nou Saskatoon an established the first permanent settlement. 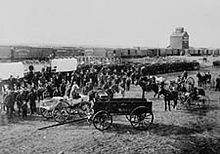 The settlers travelled bi railway frae Ontario tae Moose Jaw an then completit the final leg via horse-drawn caurt as the railway haed yet tae be completit tae Saskatoon. In 1885 the Northwast Rebellion affectit the tiny community in a variety o ways. Chief Whitecap an Charles Trottier passed through the present day Varsity campus on their way tae join Louis Riel's airmed forces at Batoche, Saskatchewan. Follaein the fechtin at the Battle o Fish Creek, an the Battle o Batoche, woundit Canadian sodgers convalesced at the Marr Residence which is the day a historic site. A few dee'd in care an wur buried in the Pioneer Cemetery near the Exhibition Grunds. A toun chairter for the wast side o the river wis obtained in 1903 (Nutana became a veelage in that year). In 1906 Saskatoon became a ceety wi a population o 4,500, which includit the communities o Saskatoon, Riversdale, an Nutana. In 1955 Montgomery Place an in 1956 the neighbourin toun o Sutherland wur annexed bi the fast growin Ceety o Saskatoon. ↑ "Population Estimate & Projection". City of Saskatoon. Retrieved 2010-11-10. ↑ Statistics Canada 2006 Community Profiles: Saskatoon CMA. ↑ "Section 1: Census metropolitan areas". Annual Demographic Estimates: Subprovincial Areas. Statistics Canada. February 3, 2011. Retrieved 2011-02-03. ↑ "Travel: Saskatoon". The Weather Network. Retrieved 2008-06-16. ↑ 7.0 7.1 7.2 7.3 "A History of Saskatoon to 1914" (PDF). web.archive.org. July 2005. Archived frae the oreeginal (PDF) on 2006-10-03. Retrieved 2009-04-04. Wikimedia Commons haes media relatit tae Saskatoon. This page wis last eeditit on 25 Februar 2015, at 01:55.